You'll find plenty of places to visit near Bangkok: Ancient City (in Samut Prakan) and Ayutthaya (Wat Mahathat, Ayutthaya Ruins, & more). The adventure continues: step into the grandiose world of The Grand Palace, browse the different shops at Siam Paragon, head outdoors with SEA LIFE Bangkok Ocean World, and contemplate in the serene atmosphere at Temple of the Emerald Buddha (Wat Phra Kaew). For traveler tips, other places to visit, and tourist information, you can read our Bangkok road trip planning website . Toronto, Canada to Bangkok is an approximately 22-hour combination of flight and train. You can also do a combination of flight and bus; or do a combination of train and flight. You'll lose 12 hours traveling from Toronto to Bangkok due to the time zone difference. Prepare for much hotter weather when traveling from Toronto in December: high temperatures in Bangkok hover around 36°C and lows are around 26°C. Finish your sightseeing early on the 5th (Sat) to allow enough time to drive to Pattaya. Get out of town with these interesting Pattaya side-trips: Mae Ram Phueng Beach (in Phe), Mae Ram Phueng Beach (in Rayong) and Sattahip (Nang Ram Beach & Ko Samae San). The adventure continues: admire the striking features of The Sanctuary Of Truth (Prasat Sut Ja-Tum), admire the natural beauty at Nong Nooch Tropical Botanical Garden, enjoy the sand and surf at Pattaya Beach, and stroll through Wong Amat Beach. For where to stay, other places to visit, traveler tips, and other tourist information, go to the Pattaya trip builder website . Drive from Bangkok to Pattaya in 2 hours. Alternatively, you can take a bus; or take a train. In January, daily temperatures in Pattaya can reach 36°C, while at night they dip to 24°C. Wrap up your sightseeing on the 11th (Fri) to allow time to drive to Khao Yai National Park. Kick off your visit on the 12th (Sat): explore the wealth of natural beauty at Khao Yai National Park. Keep things going the next day: admire the sheer force of Haew Narok Waterfall and then get outside with Khao Yai Bird Watching Day Trip by Thailand Bird Watching. 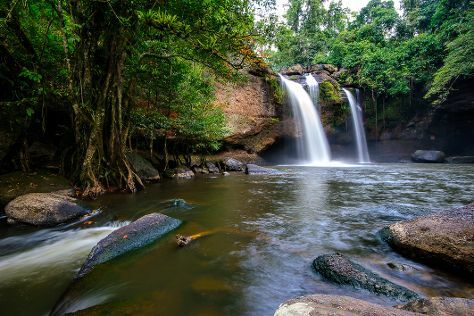 Plan my trip to Khao Yai National Park with suggested itineraries provided by Inspirock. Getting from Pattaya to Khao Yai National Park by car takes about 3.5 hours. Other options: do a combination of bus, train, and taxi; or do a combination of bus and taxi. In January, daily temperatures in Khao Yai National Park can reach 38°C, while at night they dip to 24°C. Finish your sightseeing early on the 13th (Sun) to allow enough time to travel to Krabi Town. 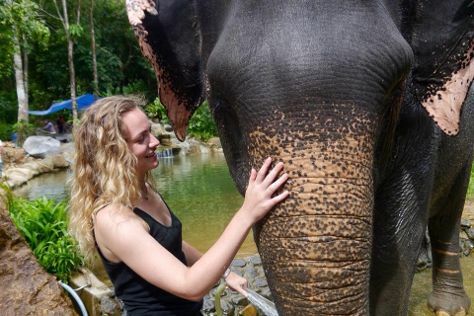 Take a break from Krabi Town with a short trip to Phang Nga Elephant Park in Phang Nga, about 2 hours away. And it doesn't end there: tour the pleasant surroundings at Railay Beach, head off the coast to Poda Island, enjoy the sand and surf at Ao Nang Beach, and stop by de' MARCO Fashions. To see photos, ratings, traveler tips, and tourist information, use the Krabi Town trip builder app . Use the Route module to find suitable travel options from Khao Yai National Park to Krabi Town. In January, daytime highs in Krabi Town are 37°C, while nighttime lows are 26°C. Finish your sightseeing early on the 19th (Sat) to allow enough time to ride a ferry to Ko Phi Phi Don. Ko Phi Phi Don is known for nature, adventure, beaches, nightlife, and water activities. Your plan includes some of its best attractions: head outdoors with Outdoor Activities, don't miss a visit to Koh Phi Phi Viewpoint, stop by Phi Phi Postcard Shop, and enjoy the sand and surf at Laem Tong Bay. To find where to stay, more things to do, and tourist information, use the Ko Phi Phi Don visit planner. You can ride a ferry from Krabi Town to Ko Phi Phi Don in 1.5 hours. Another option is to do a combination of bus and ferry. In January in Ko Phi Phi Don, expect temperatures between 37°C during the day and 26°C at night. Wrap up your sightseeing on the 22nd (Tue) early enough to ride a ferry to Ko Lanta. Spend the 24th (Thu) among aquatic life with a scuba or snorkeling tour. 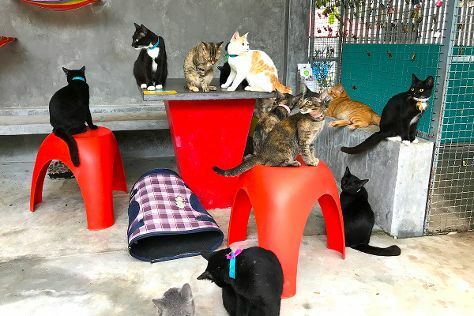 There's much more to do: identify plant and animal life at Lanta Animal Welfare, enjoy the sand and surf at Khlong Dao Beach, stroll through Lanta Klong Nin Beach, and look for gifts at The Tiger Collections. To see traveler tips, maps, and tourist information, read Ko Lanta trip planner . Ride a ferry from Ko Phi Phi Don to Ko Lanta in an hour. January in Ko Lanta sees daily highs of 38°C and lows of 26°C at night. Wrap up your sightseeing on the 28th (Mon) early enough to travel to Patong. Explore Patong's surroundings by going to Nai Harn Beach (in Nai Harn), Yanui Beach (in Rawai) and Phuket Big Buddha (in Chalong). There's still lots to do: tour the pleasant surroundings at Patong Beach, kick back and relax at Freedom Beach, take in the dramatic scenery at Gibbon Rehabilitation Project, and make a trip to Bangla Road. For more things to do, traveler tips, other places to visit, and other tourist information, read Patong tour planner. Do a combination of ferry and car from Ko Lanta to Patong in 2.5 hours. Alternatively, you can ride a ferry. Expect a daytime high around 37°C in January, and nighttime lows around 26°C. 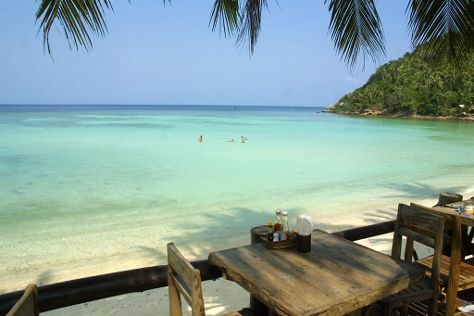 Wrap up your sightseeing on the 2nd (Sat) early enough to travel to Koh Tao. Make the 4th (Mon) a memorable day with a climbing tour. On the 7th (Thu), spend a cool day on the water with Unseen Tours Koh Tao. There's lots more to do: discover the deep blue sea with a scuba or snorkeling tour, tour the pleasant surroundings at Ao Tanot Bay, kick back and relax at Sai Nuan Beach, and hike along John-Suwan Viewpoint. To see reviews, where to stay, other places to visit, and other tourist information, you can read our Koh Tao trip itinerary site . You can do a combination of flight and ferry from Patong to Koh Tao in 4.5 hours. Other options are to take a bus; or do a combination of flight, taxi, and ferry. In February, plan for daily highs up to 36°C, and evening lows to 30°C. Finish your sightseeing early on the 7th (Thu) so you can ride a ferry to Ko Pha Ngan. Ko Pha Ngan is known for beaches, adventure, spas, fun & games, and classes. Your plan includes some of its best attractions: have fun at Kobra Muay Thai Boxing Stadium, get outside with Outdoor Activities, enjoy the sand and surf at Haad Yuan Beach, and stroll through Thong Nai Pan Noi. To find where to stay, other places to visit, and more tourist information, use the Ko Pha Ngan visit planner. Traveling by ferry from Koh Tao to Ko Pha Ngan takes 1.5 hours. In February, daytime highs in Ko Pha Ngan are 36°C, while nighttime lows are 30°C. Cap off your sightseeing on the 12th (Tue) early enough to travel to Chiang Rai. Enjoy a cultural and relaxing vacation in Chiang Rai, the capital city of an eponymous province. 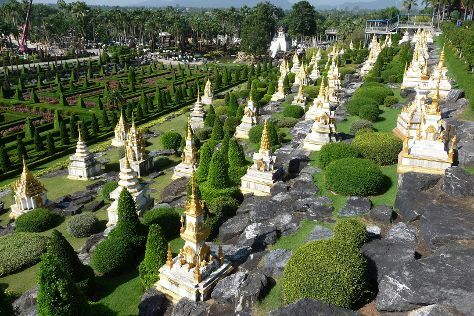 Change things up with these side-trips from Chiang Rai: Wat Phra Kaew (in Chiang Khong), Golden Triangle (in Chiang Saen) and Mae Fa Luang (Mae Fah Luang Garden, Hall of Inspiration, & more). The adventure continues: take in the spiritual surroundings of Wat Rong Khun, get great views at Wat Huai Pla Kung, get engrossed in the history at Hall of Opium Museum, and steep yourself in history at Chiang Saen. To see photos, where to stay, reviews, and other tourist information, go to the Chiang Rai trip planner . You can do a combination of bus and flight from Ko Pha Ngan to Chiang Rai in 6 hours. Other options are to do a combination of ferry and flight; or take a bus. Plan for little chillier nights when traveling from Ko Pha Ngan in February since evenings lows in Chiang Rai dip to 17°C. Finish your sightseeing early on the 15th (Fri) so you can drive to Chiang Mai. You'll find plenty of places to visit near Chiang Mai: Maeklang Elephant Conservation Community (in Mae Wang), Doi Inthanon (in Doi Inthanon National Park) and Lampang (Thai Elephant Conservation Center & Wat Phra That Lampang Luang). Spend the 16th (Sat) wandering through the wild on a nature and wildlife tour. On the 20th (Wed), spend a fun day on foot with Walking tours. The adventure continues: delve into the distant past at Wat Chedi Luang Worawihan, admire the landmark architecture of Wat Chiang Man, identify plant and animal life at Maerim Elephant Sanctuary, and look for gifts at Mesimu. For maps, ratings, more things to do, and other tourist information, refer to the Chiang Mai trip maker app . Traveling by car from Chiang Rai to Chiang Mai takes 3 hours. Alternatively, you can take a bus. In February, daytime highs in Chiang Mai are 38°C, while nighttime lows are 20°C. Finish up your sightseeing early on the 23rd (Sat) so you can travel back home.